Another round of pretty cards. Great looking blog candy too. I especially like the black and white ;you are fabulous' card. How do you pick a favorite out of those? I think mine has to be the emboss resist card. The week after I saw it, I began doing some simple emboss resist cards because I was so inspired! wow, I love them all, but the chandelier is my absolute fav! Congratulations once again on your Blog Anniversary, Colleen!! One whole year of blogging--that's just amazing! I love coming by your blog to see what you've been creating. My favorite posts are ones where you show what inspired your creation. You find inspiration in the most interesting places!! As for a favorite card of yours?? How could I choose just one!!! I love the wide variety of styles that I see here. I never know what I'm going to find--and I love that. :D Keep up the fabulous work. Here's to many, many more Blogoversaries!!! My favorite card of yours is the Dublin Door. I also think it's the first time we found each other~ :-) That is one fantastic card. I have many other cards of yours that are favs, but that always sticks out first in my mind. April 9 Emboss Resist is my favorite of this batch. First, the colors are my favorite. I am on a butterfly kick right now, and I absolutely love the white one on this card. Ribbon and pearls are great, too! There is so much inspiration here, it will keep me busy for weeks to come. Thanks! Colleen, it's so hard to pick an absolute favourite from all your lovely creations, but the one that sticks in my mind is the one that was inspired by a dental hoarding, from May 14th here! So, are you going to disqualify me since I can't pick just one favorite out of all your favorites? Well, I can't pick just one! Each card has some special element to it to love. Happy blogaversary and will await many more wonderful creations! What beautiful cards! Don't worry about entering me for the prize. I'd just like that chandelier card lol, how STUNNING is that?!!!! BEAUTIFUL. WOW! Gorgeous collection of cards! Your chandelier card is my favorite, however. I loved it then and I love it now! What a great retrospective, Colleen! Congratulations on ONE year! I remember when you just started and I was so impressed and with each blog you amazed me everytime! Your creativity is outstanding! And love your descriptions and details of each card. Keep up the great work...look how far you have come in just one year! Hmmm.......I think that your latest colour splash challenge card made for Sarah Anderson's farewell blog hop has to be my favourite of your favourites-it's very me!! However, the chandelier card comes in at a close second! Hi Colleen, thanks for offering such great blog candy! I absolutely adore your Whimsical Village card. I think it is such a cute take on that stamp. The interesting shape of the design from the Mojo Monday sketch really shows off this stamp set to perfection. Having seen all your favourites, I still love the simplicity but stunning effect of your die cut butterflies which are embossed. beautiful. Heres to many more years of crafting and blogging! It's the chandelier card..I love it!!! They are all gorgeous! How could anyone choose just one :) Congrats on your 1 year blogoversary!! i love, love the card inspired by anthropologie mug! I love garden art and this reminds me of a quilt!!! Congrats again Colleen! 1 year is very exciting. I love how you have showcased your cards over the last year. I don't think I have enough of ones I like to do that. ALL of yours are gorgeous!!! I can't pick a favorite it is too hard! OK I'll try... I love the black, white, & green butterflies as well as the green pink & lilac image! It was a tie! Does that mean we might win our favorites! LOL! Just kidding! I think it's been a GREAT way to celebrate your anniversary, Col!!! Love the walk down memory lane with you .... Congratulations once again. Congrats on one year of blogging! My favorite card is the one with the flower die-cuts that you made to match your friend's set of mugs - it is absolutely gorgeous! Thank you for the chance to win! Congrats! 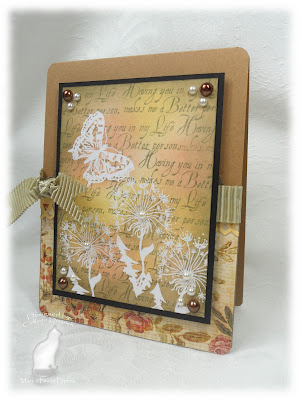 I have a few favoriates -- the chandelier card and the one with butterfly and flowers heat embossed. LOve your design and use of colors. So, so many beautiful cards to pick one; but I really LOVED that bold, floral take above, with the white background! Plus, it won several, if I remember right, recognitions; so, I wasn't the only one that fell in LOVE with that gorgeous creation! Congratulations, girl! And thank you ever so much for the chance to win!